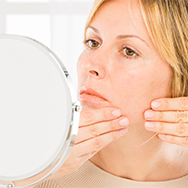 Severe to mild acne can show up at any age but when you’re older, anti-ageing concerns need to be cared for, too. You really can address both with little effort and near-flawless results. The one thing that differs for adults with acne is the other skincare challenges revolving around their desire to diminish signs of ageing and, for many, large pores. You need products for those concerns, too, so it can get tricky because the anti-ageing products you use must be carefully selected. Thankfully, a well formulated liquid BHA is one of the premier anti-ageng products you can use. Its skin-smoothing, restorative, brightening, pore-minimising, and youth-enhancing properties are well established. BHA is a uniquely multi-tasking super hero like no other! 10% Niacinamide Booster – abundant research has established niacinamide’s pore- minimising and skin-renewing benefits. Bonus: It enhances skin’s ability to hold on to youthful hydration. 1% Retinol Booster – the exciting anti-ageing, skin-renewing qualities of retinol have been lauded for over 50 years. But what’s extra exciting is the research keeps showing retinol is even more remarkable than we ever thought it could be.